Due to Google algorithm updates and some other factors, it becomes necessary to keep an eye on your blog/website SEO. SEO(Search Engine Optimization) is a process on the basis of which your blog/website appears in search results. The earlier, and more frequently a site appears in the search results, the more visitors it will receive from the search engine's users, and all this depends on SEO. So, if you want your blog/website on the first page of search results then its important that you keep an eye on your posts SEO. Here's some important SEO factors to keep an eye on while optimizing your blog posts. A good post title makes your post different from others. Post titles change the density of your posts. Search Engines, RSS feed, archive pages etc. these are the places where your post title appears. The main purpose of a title is to grab attention and entice people to start reading your post. So, make sure that your title is clear, contains all important keywords and makes a perfect sense. Just like Post Title, Post URL is also an important SEO factor for your posts. Every blog post has its own URL. A perfect URL is necessary to easily get indexed by search engines for their search results. It is important that your URL's are understandable by search engines. Wordpress, blogger and other top platforms uses your post title in your URL, which is really handy. An Alt tag is actually a HTML attribute which defines an image. Without an Alt tag search engines have no idea about your image. Without an Alt tag your image will not be visible to search engines. Search engines use robots that cannot read an image/video. Therefore, by adding an alt tag we give them ability to understand that image. So its important to add alt tags to your post images. If you don't know about adding alt tags, read this article How to Add Alt Tag to Images in Blogger. Just like all above factors, headings also has an important role in your posts SEO. Headings are used to represent different sections of your content and it has a great impact on both the SEO and usability of your site. So, using heading in your posts is good for SEO. By keeping some important SEO factors in mind while writing posts and can start a successful career in blogging. 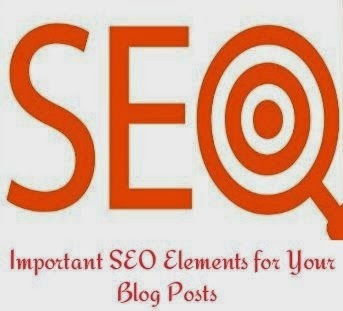 We hope this article may have helped you in learning some important SEO element for posts. Share this article with your friends and don't forget to subscribe us. Good Luck! Blogger uses Country specific domain redirection that changes your blog URL according to your visitor country. For example, if your blog address is yourblog.blogspot.com and someone is visiting your blog from canada, he will be redirected to yourblog.blogspot.ca instead of yourblog.blogspot.com and if someone is visiting your blog from Italy then he will be redirected to yourblog.blogspot.it. Why you Should Stop Blogger Country Specific Redirection? The answer is simple, it will effect your alexa ranking and your pagerank too, due to different URL's. 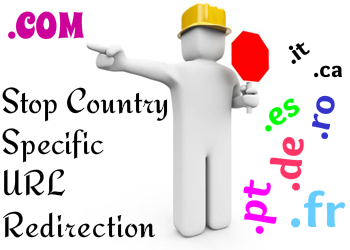 This redirection is called Country Specific Redirection or "country-code Top Level Domain" (ccTLD). The blogs with custom domains are not affected by this method. About 20 countries are affected by this redirection. Today in this tutorial we'll show you that How to Stop Blogger Country Specific Redirection. First for foremost go to Blogger.com and Log in to your account. Select a Blog >> Template >> Edit HTML and search for the <head> tag. Now copy(Ctrl + C) the following piece of code and paste(Ctrl + V) it just below/after <head> tag. Hit the Save Template button and you're done. We hope this tutorial may have helped you in learning How to Stop Blogger Country Specific Redirection. Share this tutorial with your friends and don't forget to subscribe us. 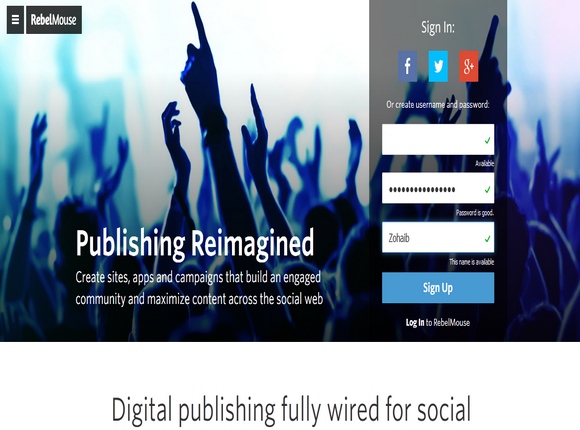 Have you heard about RebelMouse.com, a great service created by Huffington Post CTO “Paul Berry”. Basically RebelMouse is your social front page. It links Facebook, Twitter, Google Plus, Pinterest, LinkedIn, Instagram and all other pages and websites to your RebelMouse page and publishes all the content that you've shared on all these websites on one page. Using RebelMouse you can provide your users a place where you can share all your social content you produce and all on just one page. Social Hub, a social hub is a place that collects all the data and posts from all your social account and shows it on just a single page, it is just like online communities. If you still don't understand that what RebelMouse is then simply we can say that RebelMouse is a Social Hub which collect your posts from all your social accounts. And your site is ready. RebelMouse is a great place for collecting all your posts. Thousands of people are using this great service including some top brands like Burger King, Sprite, MTV and others. 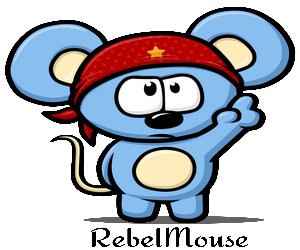 What do you think about RebelMouse? Leave your responses in the comments section below. Share this article with your friends and don't forget to subscribe us. Comment Spam is a major issue for all bloggers and identifying/removing spam comments is among the most frustrating job for a blogger. We all love comments but identifying spam comments from hundreds of comments is the toughest job, especially when you don't have time to moderate all those comments. Obviously you don't want to remove all comments just for a few spam comments. As we know that Blogger doesn't have a real-time spam detection plugin, so its your job that how you manage with spam comments. 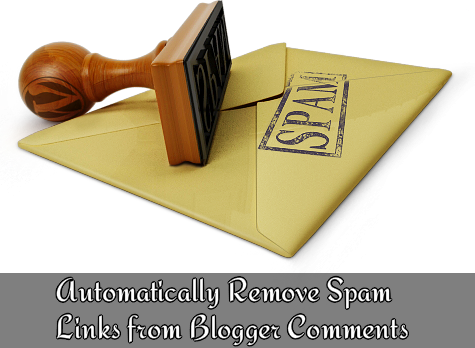 Today, in this article, we will show you that How to Automatically Remove Spam Links from Blogger Comments. I hope that this article helped you in Removing Spam Links from Blogger Comments. Share it with your friends and don't forget to subscribe us. 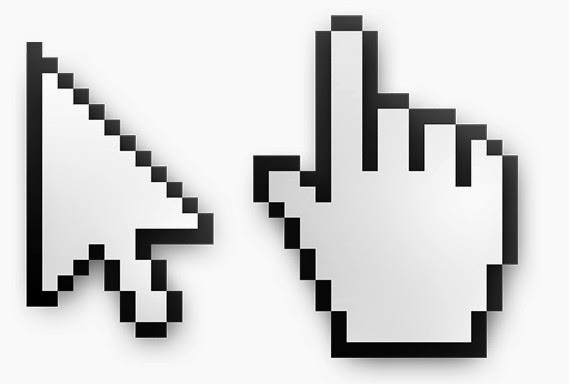 You might have seen that many sites have their own mouse cursors. When you move your cursor on their blog, the cursor automatically changes and a custom mouse cursor makes your blog different from others. Recently, one of our readers asked us to write an article on changing mouse cursor of your blog. So today in this tutorial, we'll learn that How to Change Mouse Cursor in Blogger. In the computers, a pointer or mouse cursor is a graphical image on the computer monitor or other display device. A cursor is an indicator used to show the position on a computer monitor. It is mostly used for clicking, select or for moving folders/files from one place to other. How to Change Mouse Cursor in Blogger? 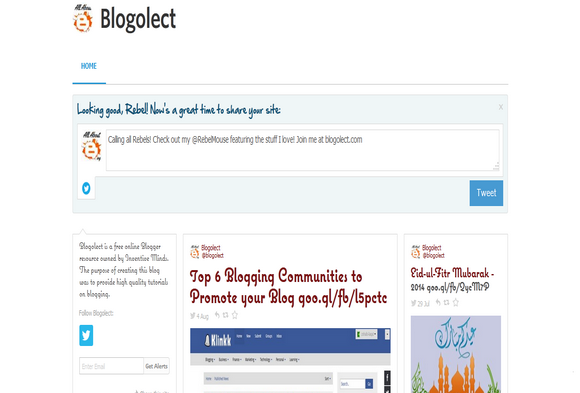 First of all, log in to your Blogger Account and select your Blog. Go to Template >> Edit HTML >> Search (Ctrl + F) for the ]]></b:skin> tag and paste the following piece of code just above/before it. Now replace Your Cursor Image with the image URL of your cursor and press the Save Template Button. Congratulations: You've successfully customized you mouse cursor. Now visit your blog and see the magic. We hope that this article helped you in customizing your mouse cursor in blogger. Share this tutorial with your friends and don't forget to subscribe us. You might have seen hover effect on post titles on many blogs (especially in blogger blogs). 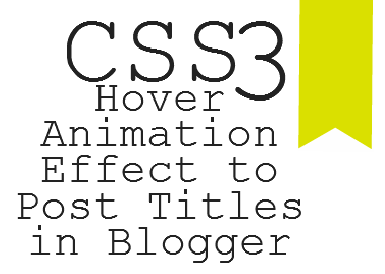 Adding a CSS3 hover animation effect to post titles will increase your readership and it'll also attract your readers. One of our readers asked us that how to add a link nudge effect to post titles in blogger. 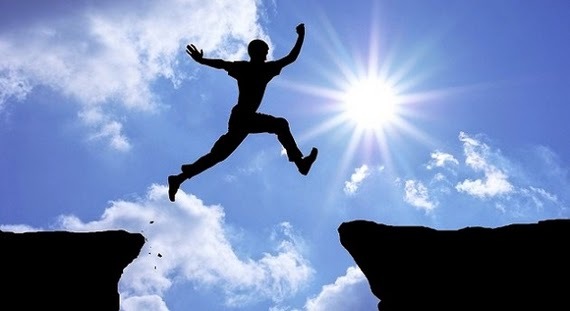 So, today in this article we are going to learn how to add CSS3 hover animation effect to post titles in Blogger. How it works? Click on the demo button and move your mouse cursor over any post title to see how it works. We hope this article helped you in learning How to Add CSS3 Hover Animation Effect to Post Titles in Blogger. Share this article with your friends and don't forget to subscribe us! Adding Rounded Corners body wrapper to your blog is a great way to make your template more beautiful and attractive. By default, there is no border/rounded border wrap in blogger templates. By adding such styles you can make your blog look like professional blogs. This wrapper will make your blog to fit in every screen and it will also attract your visitors. 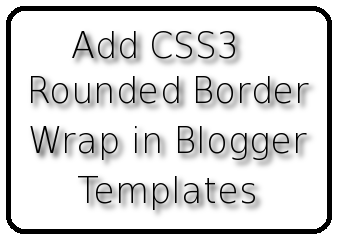 So, today in this article we are going to share How to Add CSS3 Rounded Border Wrap in Blogger Templates. We hope this article helped you in learning How to Add CSS3 Rounded Border Wrap in Blogger Templates. Share this article with your friends and don't forget to subscribe us! 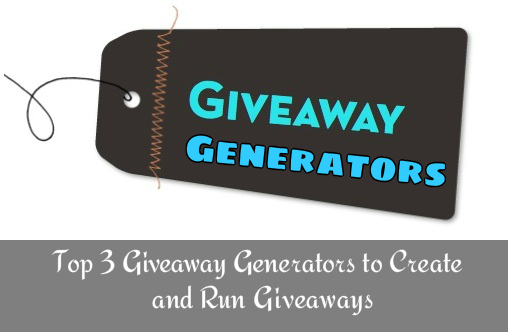 You might have seen that many blogs and directories are using Buttons for their promotion. 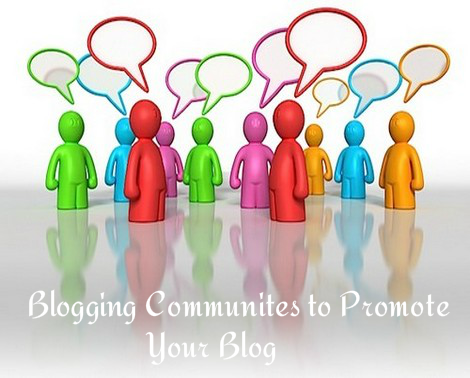 Blog buttons are becoming a very popular way to promote and link back to your blog. A badge in your blog's sidebar is really a good way to provide your readers something that they can use and display on their own blog to show that which blog's they read and it'll also increase your blog's traffic. It's really easy to create a button for promoting your blog. You can choose color, border, font style, background and text for your button by using this button maker tool. Using this tool is extremely easy and in this article we'll show you How to Create a Button/Badge for your Blog using Button maker tool. I hope this article helped you in learning How to Create a Button/Badge for your Blog and How to Add it to your Blog. Share this article with your friends and don't forget to subscribe us. Take Care! 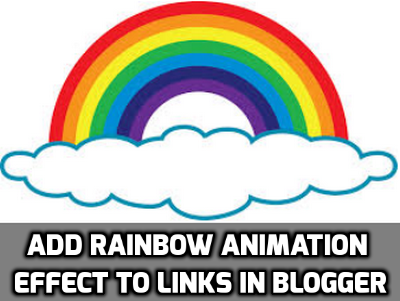 I hope this articled helped you in learning How to Add Rainbow Animation Effect to Links in Blogger. Share this article with your friends. What is a tooltip? 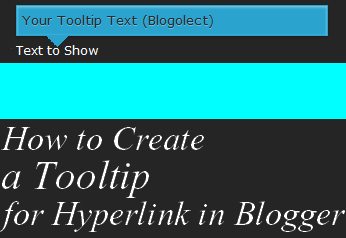 A tooltip is a text in box which is displayed over a hyperlink, when you move your mouse cursor on the link. Tooltips are used for displaying extra text over links. Tooltips can be used for all sorts of things i.e descriptions, definitions, word meanings etc. You might have seen different types of tooptips on many blogs. So, today we are going to share a simple and beautiful tooltip for your blog. In the image below "Text to Show" is your text and link and the text in the blue box just above it is your tooltip. Sometimes we want to make some gadgets visible only to us in blogger. A traffic counter, or any gadget while we are customizing it, we want to hide all these types of widgets from our visitors, until they are fully customized. 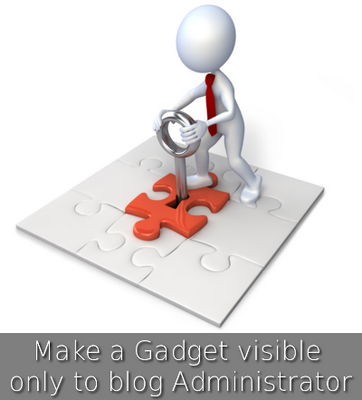 So, if you don't know that how to hide a gadget from your visitors, then don't worry, today in this tutorial we'll show you How to Make a Gadget visible only to blog Administrator. The procedure is simple and you just have to add two lines to hide a specific widget from your visitors. Congratulations: Now this widget is hidden from your visitors. Note: Sometimes the widget codes are not expanded and are in the form of folds. So to expand the widget code click on the sideway arrow next to the widget's id. Have you ever thought about removing the sidebar and creating a full width page in blogger? If you have visited our About Us and Contact page then you may have observed the difference between normal pages and these pages. The difference is that these pages are of full width and with no sidebar, which gives them an eye catching look. So if you are thinking to create a full width page without sidebar, then you're at the right place, today in this article we'll show you How to Create a Full Widget Page and Remove Sidebar in Blogger. Change the width 99% according to your needs or you can also use pixels (960) instead of it. Step 5. Click on Publish button and check your page of full width and without sidebar. We hope this article helped you in learning How to Create a Full Widget Page and Remove Sidebar in Blogger. Share it with your friends and don't forget to subscribe us! 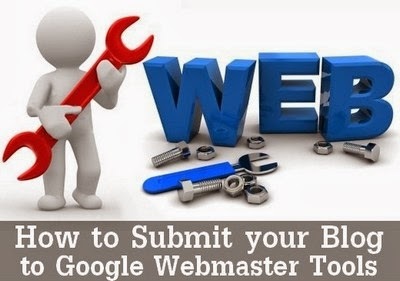 We hope this article helped you in learning How to Submit your Sitemap to Google Webmaster Tools. Share it with your friends and don't forget to subscribe us! Unique design is necessary for a blog. To get organic traffic and user attention you need to develop the blog user friendly and search engine friendly as well. 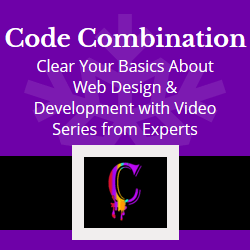 It is possible only if your blog's design is simple, attractive and easy to navigate. Sometimes we need to mention keyboard shortcuts in our blog posts. So, if you add keyboard keys effect instead of simple text, it will impress your visitors and they'll get more interested in your blog. Oh sorry, let me tell you that what is Keyboard Keys Effect? In simple words, keyboard keys effect is just normal text, styled using CSS. In this tutorial, we are going to show you How to Add Keyboard Keys Effect to your Text in Blogger. 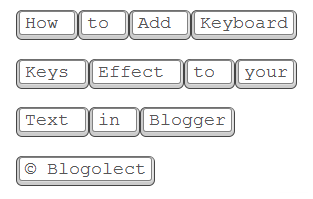 We hope that this article helped you in learning How to Add Keyboard Keys Effect to your Text in Blogger and How to use this effect in blogger. Share this article with your friends and don't forget to subscribe us! First of all let me tell you that What is Blockquote? Blockquotes are sections of text which are used to highlight quotes from other text or simply a blockquote is used to highlight a text to make it different from other text on the page. Blockquotes are used to draw attention of your readers to particular parts of your blog or if you're a blogger then you can use blockquotes for highlighting code snippets of widgets/CSS codes. Whatever your purpose, using blockquotes is a perfect way to draw your readers attention. So today, in this tutorial we'll show you How to Customize Blockquote in Blogger. Check the image below to see how this blockquote looks that we are going to share today. Using blockquote is extremely easy, from the post editor type or paste whatever you want. Select the text/code that you want to show in blockquote and click on Quote tool. 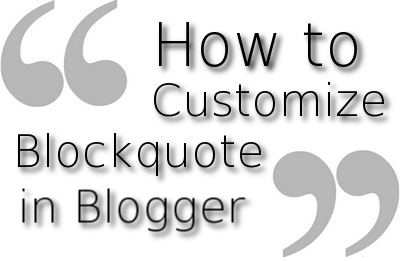 We hope this article helped you in learning How to Customize Blockquote in Blogger. Share it with your friends and don't forget to subscribe us! Page Peel effect is actually a page flip effect, when you move your cursor on over it, it flip and shows that whats behind it. There are many ways for adding this effect, and today we are going to share one of them. 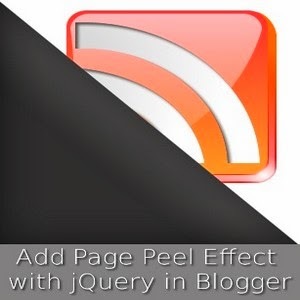 Just like other Peel effect widgets, it would also appear at the top right corner of your blog and whenever your visitors would move their cursor over the top right corner of your website, it would display the RSS Image with its link. Check the following screenshot to see how it works. Updating your Blog regularly is not only important for SEO but also for Alexa Ranking. We should update our blog daily in order to maintain our traffic which we're receiving currently and our ranking on the web. 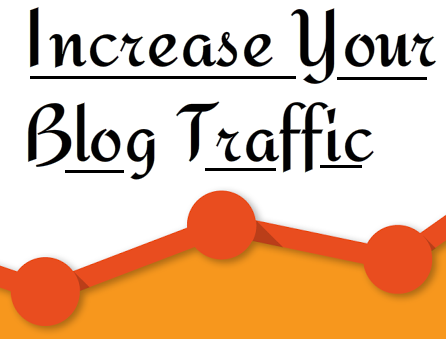 And one more thing that updating your blog daily on the same time also increases you ranking and traffic. But sometimes we don't have time to publish the post or we are unable to update our blog at accurate time. So, the solution of this problem is to schedule posts. 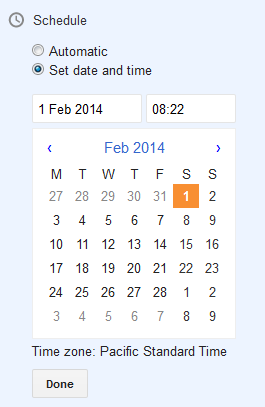 You can also schedule you posts when you are busy in your exams or other occasion. 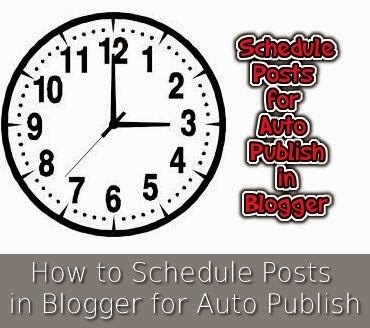 Today in this article we'll learn How to Schedule Posts in Blogger for Auto Publish in Blogger. Step 3. Now you've to set the exact date and time on which you want to publish that post. 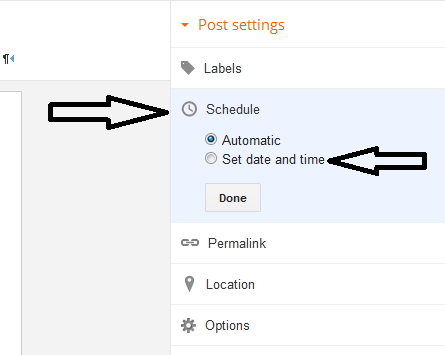 Now you post will be automatically publish on the time that you've set.